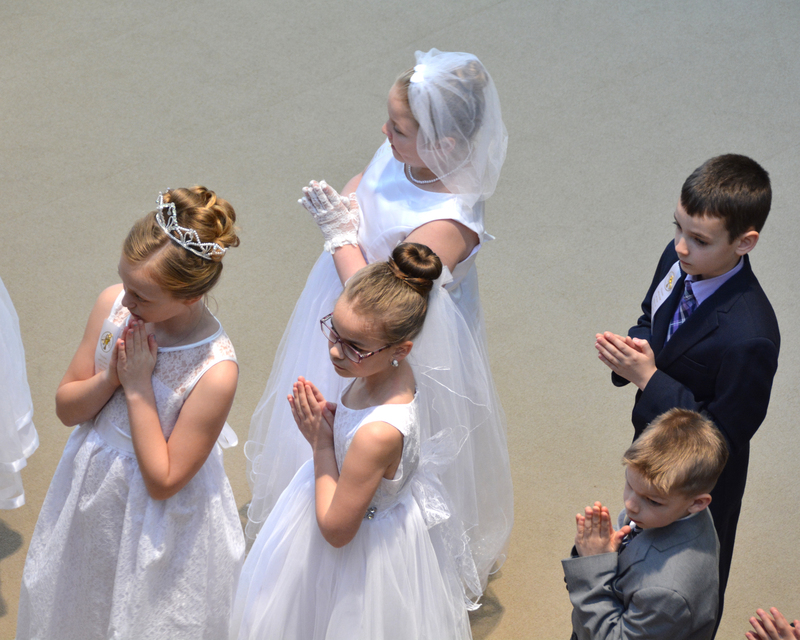 Children preparing for their First Holy Communion must be baptized and being raised Catholic. Sacramental preparation is a two-year process, beginning in the First Grade. The celebration of the sacraments of Reconciliation and First Eucharist occur in Second Grade. For information about First Reconciliation, click Here. Children are prepared for First Eucharist through regular catechetical formation, special sacrament preparation programs and home activities. Parents play a critical role in bringing their children to the Eucharist. The parish community cannot prepare children without the active support and involvement of parents and families. Parents need to bring their children to church each Sunday and ensure that they participate in catechetical sessions each week. Parents need to make faith and prayer a part of family life at home, and to work with catechists through special Sacrament Preparation Programs for parents and children. In the fall, parishioners called Prayer Partners begin praying for children whose first names are printed on cards available after Mass. Prayer Partners pray for the children throughout the preparation period until the sacrament has been received. Sometimes, parents of young children have particular spiritual and catechetical needs of their own. Preparing their child for First Communion often reawakens in parents a sense of the importance of their own faith and a desire to deepen their life as Christians. In addition to participating in sacrament preparation programs with their children, special Adult Faith Formation programs at Holy Martyrs are available and can help make this a time of spiritual growth for parents and children alike. For information and help in developing your own faith, contact Diane, the Director of Faith Formation at Holy Martyrs, at 330-952-1466.